Sleeping After Eating - How Long Should You Wait Before Bed? Common knowledge states that sleeping after eating is a poor choice. Many believe that it can lead to weight gain, indigestion, and even more serious health complaints. And although some of this accepted wisdom actually has no basis in scientific fact, eating before bed is still somewhat of a thorny issue. Whether it makes you put on weight or just adversely effects a quality night’s sleep, here’s what you need to know. As you may expect, the answer is not as simple as a “yes” or a “no.” In fact, trying to get to the bottom of this question relies on many more specifics. It really depends on what you’re eating and why you’re eating, plus whether you have a history of digestive issues, whether you’re trying to lose weight, or if you suffer from insomnia. There are many factors which can effect if it is bad to eat before bed. Learning more about these different factors is the only way to make a more informed choice. Why Is It Bad To Eat Before Bed? There are a few different issues that can be caused by eating too close to your bed time. Problems with digestion. Eating something rich or high in fat just before going to bed can cause issues with digestion. If you tend to experience bloating after eating particular foods, they should be avoided before sleep to avoid discomfort. Those who suffer from gastrointestinal reflux issues should also avoid trigger foods before bed to mitigate any potential pain. Even those who don’t usually suffer problems with digestion can experience issues is they eat too late in the evening. Causing low quality sleep. Trying to get to sleep when your stomach is gurgling or feels too full can be really tricky. If you already suffer from insomnia or other issues relating to sleep, eating too close to bed just exacerbates the issue. If you don’t get enough sleep, or the sleep you get is low quality, it affects all aspects of your life. This includes mood, work, social life, relationships, and your physical health. Disrupting a healthy meal routine. Eating a large or high-calorie meal or snack too close to bedtime can make you feel full when you wake up the following morning. This can then lead you to skip breakfast, then experience an energy crash before lunch and reach for a high-calorie snack. This starts a cycle of chaotic and unhealthy eating which can be difficult to break out of. It’s better to try to keep your eating in some semblance of a routine, particularly if you’re trying to lose weight. Gaining weight. One of the biggest factors people point to when talking about going to bed immediately after eating is potential weight gain. While the two are linked in some ways, there is evidence to suggest that this factor is more of an “eating before bed myth” than anything based on fact. Can Sleeping After Eating Cause Weight Gain? It’s a myth that eating too soon before going to bed can directly cause a person to gain weight. Calories are the same throughout the course of a day, and if your caloric intake is higher than your expenditure, you’ll gain weight. If you eat late at night and still are at a calorie deficit, you’ll lose weight. However, eating in the evening can be what pushes your caloric intake over into a surplus. If you’re trying to lose weight, what’s most important is to be mindful of what you eat in the evenings. You may be eating out of habit or boredom and not because you’re actually hungry, for example. 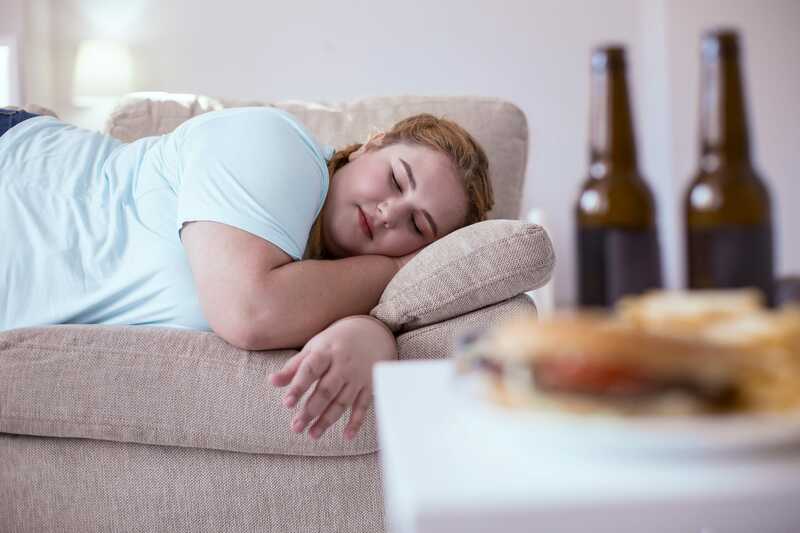 The notion that late night eating leads to sleep weight gain can also be connected to the type of foods people tend to gravitate towards in the evening. As it’s outside of traditional meal times, the evening tends to be more a time for munching on snacks. These can typically be higher calorie items like sweets, crisps, and chocolate. If you do find yourself peckish after dinner, try eating something healthier and lower in calories, like fruits or vegetables. What About My Metabolic Rate? Is It Bad To Nap After Eating? It’s an odd phenomenon that after eating, many of us experience an intense desire to go to sleep. This is due to your brain sending blood to your digestive system, resulting in a slight blood deprivation in the brain, which makes you feel sleepy. 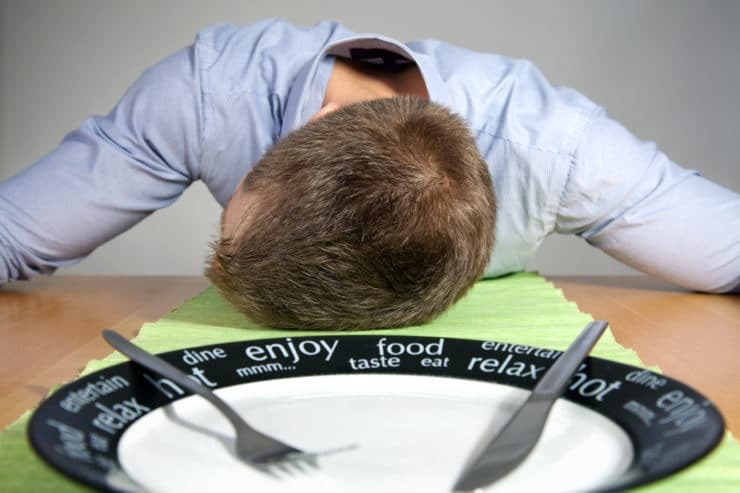 But if you’ve eaten anything rich, sugary or spicy, it could be best to avoid that nap after lunch. You’ll likely experience some digestive problems and may wake up with painful heartburn. Is It Bad To Lie Down After Eating? Even if you aren’t necessarily having a nap, after eating (particularly if it’s a bigger meal) you may feel tempted to lie down. The problem with this is that lying down post-meal may well turn into an unintentional nap. 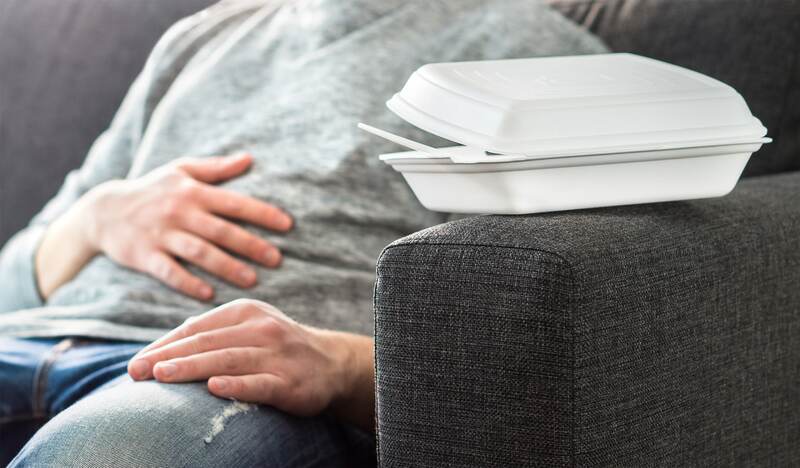 As discussed, napping simply based on the sleepiness that follows indulgent eating can be one of the biggest culprits for causing digestive issues. These include heartburn and acid reflux. But the very act of lying down can also cause problems for those with gastro-intestinal or digestive issues. This is because when lying down, it’s much easier for stomach acid to splash back into the throat. In fact, the entire digestive system works more smoothly when your body is in an upright position. For those who often face acid reflux, if you can possibly stay upright, it’s recommended. There are conflicting opinions on the actual timescale of when to stop eating before bed. Generally speaking, there is no exact timeframe of how long to wait after eating to sleep. However, if you suffer from gastrointestinal issues, the broad recommendation is to wait around three hours between eating and going to bed. This gives your food time to move out of your stomach and into your small intestine, where it is much less likely to cause acid reflux or heartburn. Whilst going to sleep too soon after a big meal can cause disruptions and poor quality sleep, so too can going to bed hungry. If you consistently find yourself extremely hungry later in the day or just before going to bed, there are some things you can do to make sure you aren’t trying to sleep while desperate for food. It’s never a good idea to go to bed hungry, as it can lead to the desire for midnight snacking, typically on less nutritious, higher calorie foods. You should make sure that you’re eating enough calories throughout the day, and that they are well spaced out. This helps you avoid both extreme hunger and extreme fullness. You should also make sure you’re well hydrated. Dehydration can often present itself as a false feeling of hunger. If you’re concerned about your diet or hunger, make sure you consult your doctor for specialised advice on the topic. If you really need to eat before sleeping, it’s most important to make sure it’s the right thing. It should be healthy, not overly substantial and above all, easy to digest. Fruits, vegetables or whole grains are ideal, though things like yoghurt, crackers or a small amount of lean meat should also not adversely affect sleep too badly. So What’s The Deal With Sleeping After Eating? Ideally, your last large meal of the day should be around four or five hours before you go to sleep. If you’re hungry after dinner, eating something small and fairly easy to digest like a piece of fruit shouldn’t cause you any problems, either in terms of weight gain or poor quality sleep. If you’re eating healthy foods in appropriate quantities, and you don’t suffer from acid reflux or heartburn, there’s no reason why eating a healthy snack before bed should cause you any problems. However, if you find yourself mindlessly snacking on high calorie treats during the evening, or you often find your digestion is causing sleeping problems, you may want to try to avoid eating directly before heading to bed.